The Romans loved to re-create their glorious deeds. It is well known that some of their famous battles were re-enacted in their arenas and amphitheatres, and some of these buildings were even designed to be able to be flooded so that re-creations of naval battles could be staged in them. During the Middle Ages, the life and death of Christ, as well as events from the lives of saints, were performed in the streets of towns and villages, and even today some of these traditional processions are still to be seen – the Procession of Holy Blood in Bruges is only one of many such examples. Perhaps our Stone Age ancestors recreated hunting scenes before an audience of their youngsters, as Bushmen still do today. Living History has quite a long tradition of bringing the past to the attention of the public. Look at that cool guy! The widespread popularity of re-enactments is undeniable. Large crowds assemble for annual festivals or for the re-enactment of historical events. Tarragona, in Spain, Hastings, in the United Kingdom, and Waterloo, in Belgium – these are just a few of the many places in Europe where thousands upon thousands of visitors flock each year to see the past come to life, re-enacted by dedicated people completely engaged in their roles, either in full armor or dressed as civilians going through the daily lives of our ancestors. A few decades ago there were only limited opportunities to see, for example, a Roman centurion or Napoleon’s troops in the field, but today such appearances have become much more common, and we can witness almost any historical figures, ranging from prehistoric cavemen to young “flower power” men and women. More and more museums, as well as archaeological and historical sites, have turned to this lively way of presenting the past. If you visit Hampton Court, in the United Kingdom, it is likely you will meet Henry VIII himself, and (at least) one of his wives. You will find men and women in the kitchen, preparing the meals for the court household. You can ask them what they are doing, and more specifically, how they are doing it. This is not only for the public’s amusement, but also to spark or increase its interest. In fact, in recent years almost all historical TV documentaries have tended to use actors to re-enact historical events or figures to explain the subject to viewers. One must admit that this way of representing the past not only looks good on screen, but also makes those documentaries much more lively, appealing, and understandable. With the correct balance of entertainment and historically-correct contents, the re-enactor is able to quite literally bring the past back to life. Spectators become involved because with Living History they live history by employing all their senses. That is why the public is so attracted to this way of presenting our heritage – people can literally see, feel, and touch the past. This lively approach enables one to attract a different public, composed of people who otherwise might not so easily decide to enter a ‘temple of culture’. Thus, re-enactment can provide a first step towards getting people interested and involved in their ancestors, their past, and their cultural heritage. It makes history attractive and understandable, which can, or should, be the main goal of historical re-enactment. Living History can be incorporated into the normal running of historical monuments, museums, or heritage centres. Educational projects that apply the principles of hands-on archaeology and re-living the past are greatly appreciated by visitors, and thus museums or sites where the visitor is able to touch objects (or replicas), can (or try to) use tools, dress up, or play an ancient game have become much more common during the past decade. It is no longer rare to meet a guide who is dressed up as a historical figure and who can interact with the public. 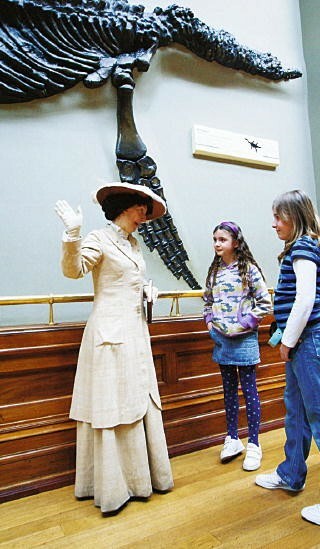 Who better to explain her fabulous finds than the ‘fossil woman’ Mary Anning (1799 – 1847) ‘herself’? Now I will take a closer look at the example of the Provincial Archeological Museum of Velzeke, Belgium.1 For over 20 years this museum has been involved in historical re-enactment; it organizes festivals around a specific theme every year, and the public loves them. The Caesar Festival, involving about 400 re-enactors, drew more than 20,000 visitors to the small village of Velzeke, despite a dreadful rain storm. Last year’s theme was ‘Conflict’, in which the uprising and defeat of the Batavians was staged. 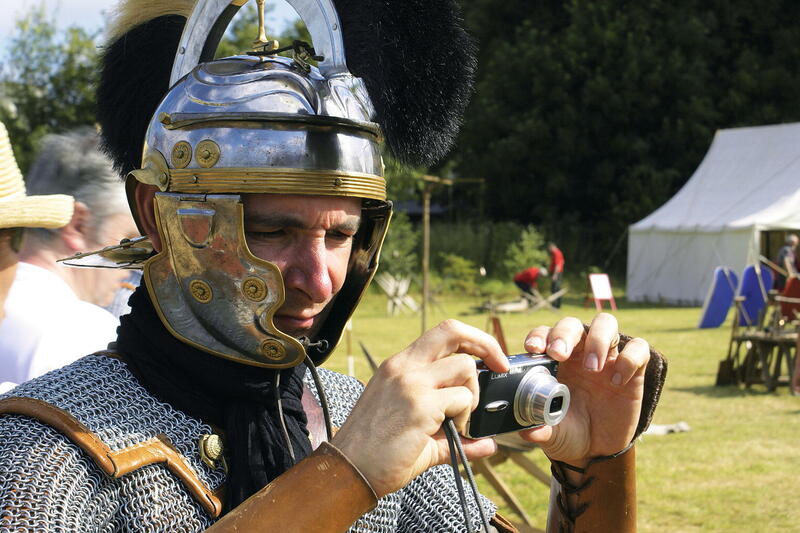 The battles are popular, but the public could also see a Roman fashion show, cavalry demonstrations, a slave market, taste Roman food and drink, or visit a Gallo-Roman market square. The goal is not entertainment (or income), but to attract people who otherwise might not have found their way to the museum and to inform them about history and our ancestors. More than a quarter of the total number of annual visitors come to the museum during these weekends. But this is not the whole story. From the outset, the museum was looking for ways to introduce the experience and information gained during these historical festivals into the daily programs for visitors. 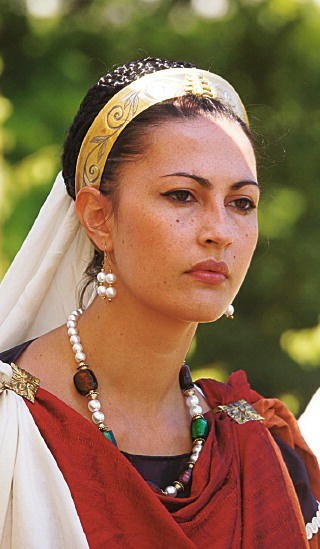 Hands-on archeology was a logical step, but groups can also experience and feel the past by dressing up as local Roman subjects in their traditional (pre-Roman) garments, or as the rich citizens who copied the fashions coming from Rome – that is how the process of Romanization is explained. ‘Roman army’ performing in Marle, France (Peter Van der Plaetsen, 2008). Peter Van der Plaetsen, 2007. Replicas of prehistoric clothes are used to dress up a group of visitors and by doing so show that our ancestors were not those long-haired barbaric creatures with clubs, dragging their wives by the hair. In this way, a lesson about prehistory that otherwise might have been rather dull is now imparted visually, and thus can be better understood. In another educational project, the history of Western Europe is explained by using copies of weaponry. Where and when did the first armies rise? How did Rome conquer Gaul? Why did Rome eventually lose control? All these questions are answered, while the visitors are invited to actually put on chain mail, plate armor, and helmets, and to handle shields, spears, and swords. Of course dressing up is great fun, too, but there is always a story behind the action, told by dedicated guides. For this purpose the staff studies the subject thoroughly to keep themselves from making errors and telling false stories. The guides are well-informed, and their information is kept up to date by both the archaeologists who dig the site of Velzeke and external specialists. It is important to point out that these projects are not just another way to entertain the public. They impart knowledge, making a visit to the museum not only stimulating and fun, but also a way of learning the most recent scientific data about the past. Is the whole business of re-enactment a serious one? Scholars often regard living history as mere amusement for the public and of little intellectual value. Re-enactors are sometimes labeled a bunch of hobbyists. Indeed, one can question the historical relevance of certain experiments, and representing the past in the present is surely an audacious task. How is one to re-enact, for example, a battle that originally involved many thousands of combatants with only a few hundred re-enactors? Is it really possible to fully understand the way of living and coping with the problems of our ancestors by living for months as they did during the Stone Age, Iron Age, or medieval times? To what degree is our modern society and way of living infiltrating such interpretations? 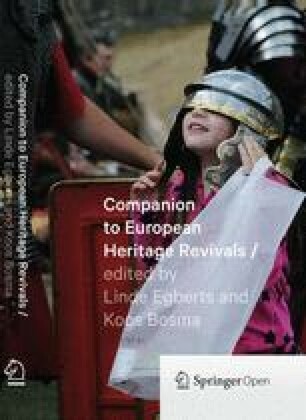 One should always keep in mind that re-enactment is an evocation: an event that tries to bring an historical event or figure to the attention of the public. And one must be careful in drawing conclusions from such living historical experiments. Furthermore, scholars, organizers, and the public need to be aware (or be informed) of the fact that re-enactment is an interpretation of the past viewed from, and therefore biased by, our 21st century point of view. I am well aware of the many anachronisms and stereotypes that are involved in the any such presentation of history.2 Sometimes re-enacting periods about which we know very little or are remote in time are particularly popular with certain groups or individuals. The more obscure the history gets, and the scarcer or more uncertain the scientific data, the easier it becomes to ‘perform’ something. After all – who then can contradict the re-enactor? Anachronism in Marle, France (Peter Van der Plaetsen, 2008). At other times I have seen that many centuries of history are just thrown together in one big pile, so that one may encounter so-called medieval knights, equipped with replicas of 1,000-year old shields but with fourteenth century swords and helmets. Similar unhappy combinations are seen in some so-called ‘Iron Age’ re-enactments. And I am not referring just to re-enactors who are unintentionally wearing their watches or sunglasses, nor to someone’s cell phone ringing during a performance. That is not deliberate (I hope), but simply amusing. Other anachronisms can occur in multi-period events. One might notice, for example, a knight of William the Conqueror’s army having a chat with a soldier wearing a Sten gun. While such encounters might create humorous photo opportunities, one can scarcely take offence at them. I consider these and many other such inaccuracies as growing pains. Some people never get beyond them, nor do they wish to. In those cases we are dealing with ‘show for the sake of show’, something which is purely for amusement and of no value whatsoever for our purpose. Indeed, these ‘Hollywood’ and ‘comic book’ figures emphasize stereotypes about the past. One sees this in Rome, for example, when tourists have their picture taken next to Roman centurions. The fact that their armor is plastic does not show in the photo, but we obviously cannot regard these people as serious re-enactors; they do it purely for the money, not for transmitting history. Reconstructing the past by re-enactment has evolved from being a mere pastime to become a more professional enterprise, where serious discussion about accuracy and historical authenticity is central. Although exceptions will always exist, I have noticed a growing interest in authentic representation of the character or period among re-enactors in recent years. More and more they immerse themselves in their roles by studying the period and discussing recent scholarly data and archaeological finds bearing on the subject. They gain knowledge about the past by thorough study, collecting as much information as possible, and digging deeply into details. They are trying not only to fine-tune their performances and thus make them as accurate as possible, but also to gain insights into historical events and facts that otherwise may never have been discovered. They approach the subject from a very practical point of view, which can differ greatly from that of the scientists. Some re-enactors want to have the very best equipment and invest a lot of time and money to obtain it. A whole specialized industry of producing clothing and artifacts has evolved to serve them. And what they cannot find, they try to produce themselves. Trying to make weapons and artifacts in the original materials and with ancient tools can yield considerable insight into former techniques and expertise. In fact, many re-enactors have become dedicated experimental archaeologists. This experimental archaeology plays an important role in today’s Living History. It has become common practice to experiment on how to produce certain elements of one’s own equipment and to learn to work with metal, bone, wood, leather, inlaying of enamel, clay, etc. In some cases, they do this work with the public present, and they may even discuss the processes with their audience. One example is the Roman Furnace project in Velzeke, where a unique example of a wood-fired glass furnace was built. Each year experienced glassblowers from all over the world gather here to experiment with techniques of producing glass in the Roman or medieval way. 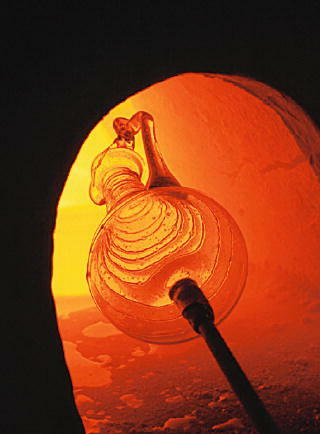 Visitors can not only witness the magic of fire and glass but also see people involved in glassmaking or collecting. Both amateurs and professionals meet there annually to observe and discuss the process. 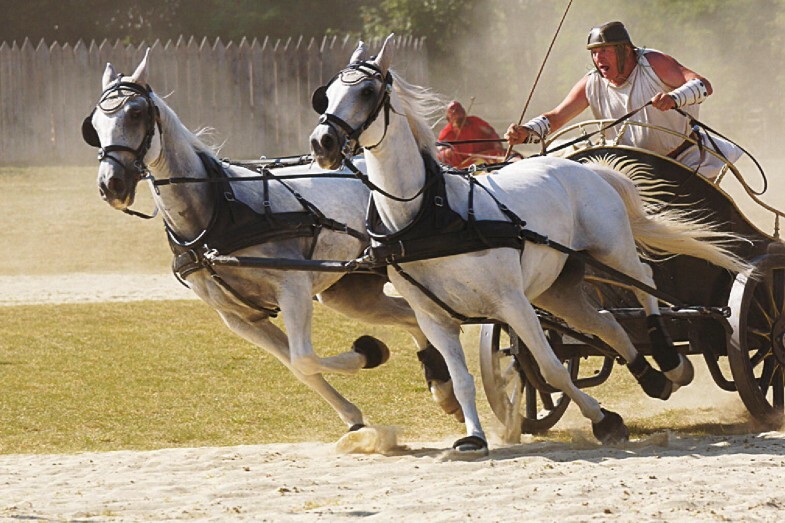 The manner in which a Roman centurion moves, how it forms the testudo or learns to throw pilae requires a lot of training and trial and errors. Why not try these maneuvers with the public present? Sometimes experiments are undertaken on a much larger scale. A long-term project began in 1995 at Guédelon,3 France, with the aim of building a chateau using local materials and only medieval building techniques. The motto of this experiment is ‘Build to understand’, and the project certainly has generated a lot of practical information and new insights into medieval building techniques and organisation. One valuable feature of this project is that all this hard labor is performed in the presence of the daily visitors. The organizers intend to attract a broad audience for their unique project, and hundreds of thousands of visitors have already witnessed its progress. That progress may be slow, but visitors have learned to respect the technical expertise and perseverance of our ancestors. Over the years, historical re-enactment has also matured in another way. The current circuit includes representations of the whole historical spectrum, from the earliest periods to very recent ones, including even the less popular among them. Along with military groups, who dominated the scene for many decades, re-enactors of the everyday life of the past have gained a strong foothold. Historical festivals now feature cooks, blacksmiths, shoe salesmen, jewelers, and many other crafts persons in action. Today, even most military groups also show the daily routines and activities of camp life to the public, confirming the growing interest in the diversification of subjects within the community of re-enactors. I have tried to show that many re-enactors have evolved into a group impassioned by the past, who re-live and experience the past, and who can provide first-hand facts and figures. Their passion for history and knowledge of certain periods, crafts, or historical figures, as well as their involvement in experimental archaeology, can also yield important scientific data. Accordingly, I suggest that instead of ignoring the ‘hobbyists’, scholars and scientists should engage with them and encourage them to strive for even greater historical accuracy. They can do this by providing them with the latest historical and scientific data and discussing it with them. Re-enactors, I believe, have become heritage communicators, because they can communicate scientific information directly to the public – not in writing or by words alone, but by practical demonstration. Re-enactment has become a more serious business, and re-enactors now often move far beyond their own frontiers. Tarragona, Spain, for example, is the annual meeting point for everyone in Europe involved in Roman re-enactment. The remembrance of the Spanish Wars of Succession started on a small scale in Blenheim, Germany, in 2004, and at Ramillies, Belgium in 2006. When the ‘troops’ assembled in Almansa in April 2007 for the re-enactment of the bloody battle that was fought there, the size of the event had already blossomed to a larger scale. Just one year later, more than 400 re-enactors from all over Europe assembled to pay tribute to the men and women who fought and died during the Battle of Oudenaarde, Belgium in 1708. Groups came from Russia, Poland, Germany, Holland, France, Britain, Ireland, Belgium, Italy, Spain and Portugal. It was a truly international gathering of a rare breed of re-enactors. At first it was very hard to find people who re-enacted early eighteenth century warfare. But from 2004 on, an ever-growing number of individuals and groups have become interested in this period, and eventually they moved from Spain to Belgium to stage an impressive evocation of the Spanish Wars of Succession. The evocation of the battle itself was only one of many activities organised around the commemoration of the Battle of Oudenaarde. All the data on the subject of the Spanish Wars of Succession and the Battle of Oudenaarde were compiled in a scholarly publication,4 which accompanied an international exhibition. Specialists in battlefield archaeology came to the Flemish Ardennes to thoroughly investigate the battlefield itself using modern non-destructive methods. But what most people will remember is the roaring of the 20 cannons and the hundreds of muskets, the charging of the cavalry, and the colourful costumes of the troops. The Battle of Oudenaarde will thus not be forgotten. 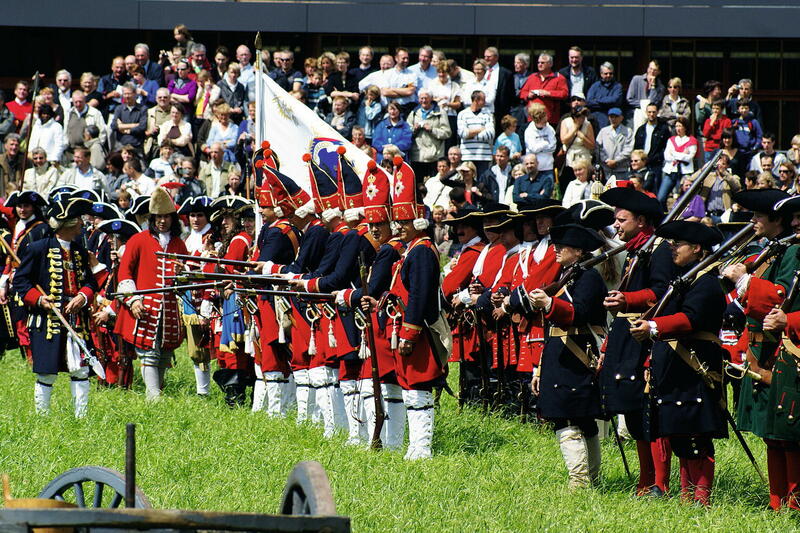 Without doubt the biggest Living History event in Europe is held at Waterloo, where many thousands of enthusiasts from all over the world gather before an ever-increasing crowd. The evocation of the Battle Hastings of 1066 is another example of an international gathering of re-enactors. ‘Roman military kitchen’ in Marle, France (Peter Van der Plaetsen, 2008). 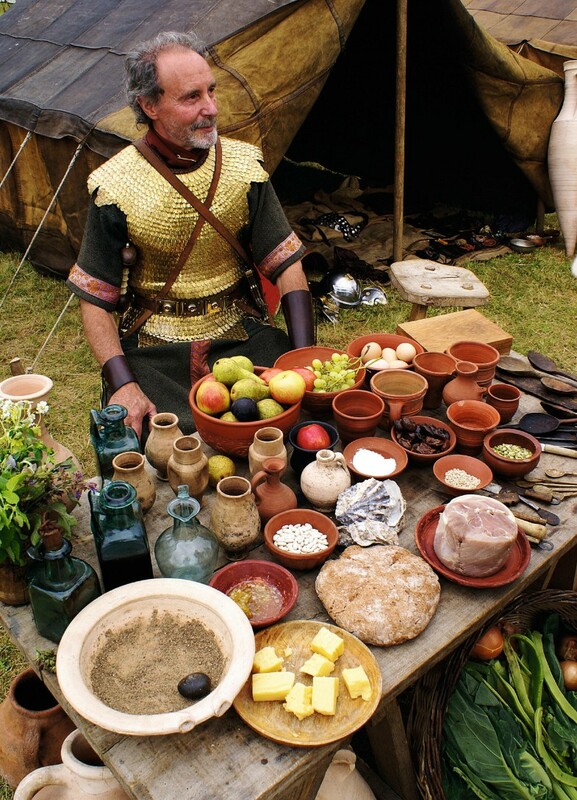 An example of a more peaceful nature is the big, twice-yearly international re-enactors market,5 held in the United Kingdom, near Coventry, where thousands of re-enactors come to buy their clothes and fabrics, armor, weapons, cooking pots, wooden buckets, etc. And if one does not find what one is looking for at the market, one can always turn to the internet. An extensive international network dealing in equipment has developed, some of which is of top quality, and even more importantly, information can be found on how to produce equipment oneself. On the internet, there are international forums where one can discuss objects and their use in great detail. ‘What man has made, man can make again’ appears to be the watchword. In short, there is an ever-growing international market that can provide artifacts and equipment, a fact museum and sites can take advantage when they are choosing replicas for educational programs or other activities. Moreover, finding a skilled craftsman able to make replicas of actual objects owned by museums has also become easier. Another aspect of historical re-enactment is the involvement of the local community. 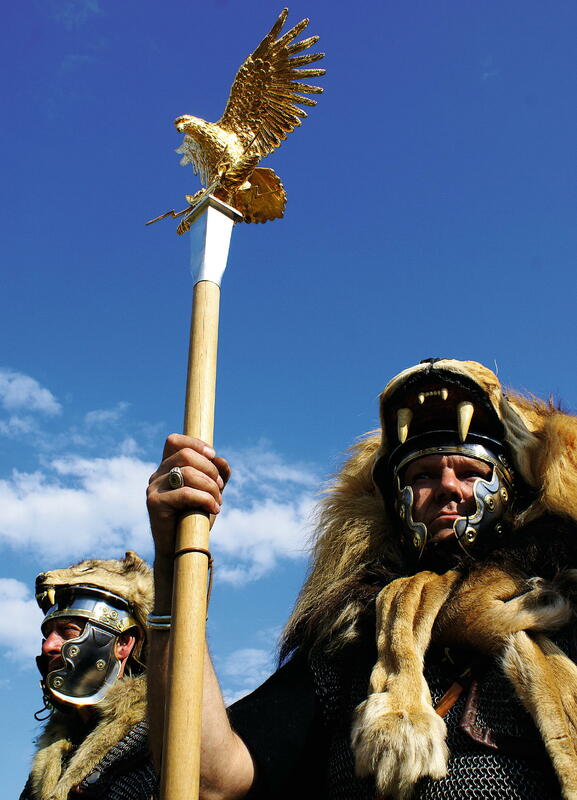 In Velzeke, for example, each historical event or Gallo-Roman market can count on the collaboration of the local merchants’ association and of local volunteers who will dress up like Gauls or Romans for the occasion, and in doing so feel like a part of their own past. Local involvement was one of the key aspects of the commemoration of the Spanish Wars of Succession. When this tercentenary began, the local councils and communities in Blenheim (Germany) and Ramillies (Belgium) took the initiative and planned the events, although their resources were quite limited. The Spanish town of Almansa was the first organiser to contact many groups abroad, but it did not neglect to include its own community in order to provide more colour and lend more substance to the event. Local girls and women dressed up in colourful costumes to join the parade with the men in uniform. This small town also organized a local traditional market and other activities involving its inhabitants. Evocation of the Battle of Oudenaarde from 1708, Oudenaarde, Belgium (Peter Van der Plaetsen, 2008). For the commemoration of the Battle of Oudenaarde, the town council took a further step, organizing a historical parade involving about 600 people. Many of them marched in their hometown side by side with re-enactors from all over Europe. More than sixty riders from local equestrian clubs dressed up for the occasion in eighteenth century costumes and joined the cavalry parade. For two days the market square of Oudenaarde was completely filled with people, both participants and spectators, instead of cars. In fact, one of the key figures in the organising Oudenaarde 1708, was so impressed by what he saw that he has become a dedicated re-enactor; he owns a cannon, and with his five gunners he is a regular guest at both local and international events. By involving the local community in such events, it is possible to create a strong awareness of its past and make people feel proud of it. As a consequence, they will also support the activities of your museum or site. People take pride in their local history. I have outlined our practical experience with re-enactment, and have sought to draw your attention to the increasingly professional and international outlook of the community of re-enactors and to the opportunities offered by the incorporation of Living History into the daily program of historical sites, heritage centres, and museums. Living History appeals on many levels. The public loves to see people dressed up, performing daily tasks, producing objects, or fighting, and this kind of presentation allows people to experience their history and heritage in a different way. It also attracts visitors who otherwise might not come to the site. Because of the interaction between the re-enactors and the public, I regard them as heritage communicators who bring the past to life in a vivid manner via their personal experience and knowledge. This is first-hand information, and thus those re-enactors who are serious and take pride in what they do are not only good communicators; they are also potential source of important scientific data useful to archaeologists and historians. You simply have to insist on maintaining high standards among the re-enactors you work with regarding both performance and equipment, as well as screen out ‘Hollywood’ and comic-book figures and the like! Finally, I want to stress that allowing the public to see and touch the past is not our principal aim. In our experience, re-enactment it is a very effective tool for making the public understand the past and appreciate the achievement of our ancestors, which is the ultimate goal of the enterprise. I would like to express my sincere thanks to Mark Taylor, and David Hill, the Roman Glassmakers, and Peter Clarck of the Canterbury archaeological Trust for their comments and corrections. I also thank Britt Van Nieuwenhuyse and Dr. Luc Van Durme for proofreading the draft of this article, and Britt, in particular, for reading it again and again. Open Access This chapter is distributed under the terms of the Creative Commons Attribution Noncommercial License which permits any noncommercial use, distribution, and reproduction in any medium, provided the original author(s) and source are credited.